The state of South Carolina is seeking nominations for an award to recognize individuals who are doing extraordinary work for the natural environment. Nominations will be accepted through May 12. 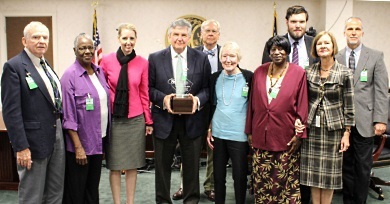 The S.C. Environmental Awareness Award, now in its 21st year, was established by S.C. General Assembly during the 1992 legislative session to recognize outstanding contributions made toward the protection, conservation, and improvement of South Carolina's natural resources. Nomination guidelines and application forms are available by on the SC Environmental Awareness Award webpage, or through e-mailing or calling Stacie Crowe, crowes@dnr.sc.gov, (843) 953-9092. Members of the awards committee represent the S.C. Forestry Commission, S.C. Department of Health and Environmental Control, S.C. Department of Natural Resources and S.C. Sea Grant Consortium. The 2014 Environmental Awareness Award winner, George W. McDaniel, Ph.D., was honored for his impressive body of work merging environmental conservation and historic preservation which spans many decades. He was the director of Drayton Hall Plantation in Charleston.